Northcliff High presents Sister Act The Musical in its 20th year of touring to Durban. It is hard to believe that this much time has passed since that first hugely challenging mission when in 1999, Northcliff High dared to venture out of Johannesburg into unknown territory, transporting a whole company of performers, musicians, staff, sets and props to present the musical Chicago to a then pretty-unresponsive and very small number of audience members at The Natal Playhouse, as it was then known. Over these 20 years, star performers have come and gone, there have been highs and lows and many young persons have grown and benefited from this unique and highly enriching experience. In this 20th year (possibly the last) Northcliff raises the bar and the roof with a truly stand-out offering which has genuinely played to sell-out packed houses and standing ovations, the charming, funny and heart-warming musical comedy, Sister Act The Musical. The standard is higher, the singing is uplifting and the comedy is fresh and delightfully entertaining. In the lead role as a new discovery, Pride Mncube, who captures the persona of the lead character, Deloris van Cartier with the confidence and skill of a seasoned performer. “Impressive!” is the response she has earned and all the more so when considering she is only in grade 9. Sister Act The Musical is based on the movie starring Whoopi Goldberg and Maggie Smith in which the lead character, Deloris, witnesses her gangster boyfriend Curtis, bump off one of his thugs, after which she is on the run to escape Curtis’ clutches an she turns to the Philadelphia Police Department for help. Their solution is to hide her in the last place he would think to look, a convent, until she can be a witness in Curtis’ trial. 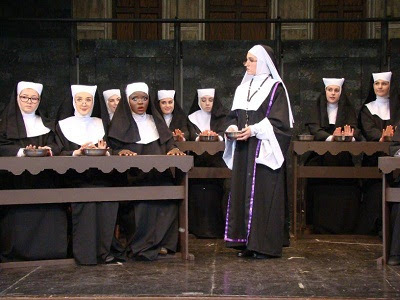 At Queen of Angels, she encounters her nemesis, the mother superior who, to keep her out of mischief, places her in charge of the nuns’ choir with astounding results. She transforms this hapless, tuneless group into a singing sensation that gets invited to sing before the Pope! And this tale is not without a romantic twist as she eventually hooks up with constable Eddie Souther, her mentor, in the happy ending. Northcliff High, Johannesburg, has been bringing productions of a high standard to the Durban public for two decades and this latest offering could just be the cherry on the top. Sister Act The Musical runs in the Playhouse Drama Theatre from June 26 to July 1, 2018, with performances from Tuesday to Saturday at 19h30. There will be an extra show on Saturday (June 30) at 14h00 and a matinee on July 1 at 15h00. Tickets R110 except for June 26 at R50, June 27 at R70. Pensioner/senior citizens R90.